Guiding monitoring and evaluation within the CCAFS program. 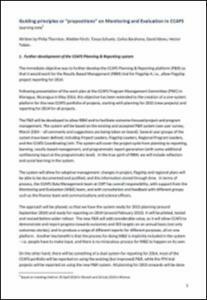 A CCAFS Planning & Reporting platform (P&R) has been developed so that it works for the Results Based Management (RBM) trial for Flagship 4, i.e., allow Flagship project reporting for 2014. This objective has been extended to the creation of a one-system platform for the new CCAFS portfolio of projects, starting with planning for 2015 (new projects) and reporting for 2014 for all projects. Thornton P, Förch W, Schuetz T, Barahona C, Abreu D, Tobón H. 2014. Guiding principles or "propositions" on Monitoring and Evaluation in CCAFS. Learning note. Copenhagen, Denmark: CGIAR Research Program on Climate Change, Agriculture and Food Security (CCAFS).